About one in seven people on earth use the messaging app WhatsApp every month, and over three-quarters of the world’s ‘smartphone using population’ use one of the current 24 messaging applications daily. Messaging is clearly becoming ever more central in people’s lives, and corporations are increasingly developing technology to meet their customers where they live their lives. At a recent webinar we hosted at Syndeo, I was delighted to introduce Oliver Lennon, who has many years experience in the customer experience arena and founded Syndeo, talk about what the future holds and how to avoid “Chatbot Hell”. 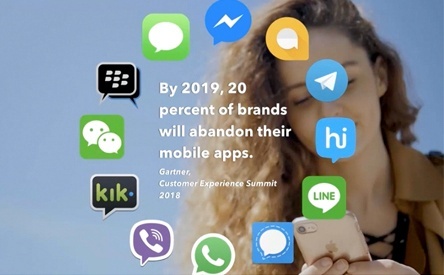 We are in the early stages of the evolution of chatbots, and it is predicted: “that by 2019 20% of brands will abandon their mobile apps”. This “hell” is rising as a result of a proliferation of “stand-alone chatbots”, which Oliver believes can only be avoided by adding Personalisation, increasing Automation and Connecting better with the right expertise (inside or outside the organisation). For your customers Syndeo enables communication via ANY APP – start the conversation on one app and seamlessly pick-up again on another. For the business, we collapse all of these interactions into a single platform. Syndeo’s unique BLENDED AI technology guides your customer using the best combination of self-service and assisted-service at every step of their journey. Our AI engine is built specifically for customer experience interactions. With Syndeo you can deploy new experiences in a matter of hours and totally CODE-FREE; You can rapidly adjust to meet the evolving needs of your organisation and your customers. No need for specialist skills.